Bagans, proprietor of Zak Bagans’ Haunted Museum at 600 E. Charleston Road, has in his clutches a painting of Manson created using the convicted killer’s ashes. This is a common medium for artist Ryan Almighty, who uses human blood (in this instance his own) and human remains to create his artwork. Bagans, host of the Travel Channel’s paranormal investigation series Ghost Adventurers, received the painting Saturday morning. He is having it framed and plans to display the work beginning Wednesday (August 1) in a museum room dedicated to convicted killers. Thus, the new piece will be displayed alongside such items as Manson’s false teeth and the art he created during his 46 years in prison. In the past, Bagans has displayed a bloody Manson hand print, paintings created with Manson’s urine and jewelry made from his hair and underwear. 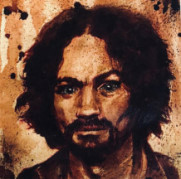 Bagans is certain of the authenticity of the materials used in the painting – specifically Manson’s remains – as his production company is developing a documentary about the serial killer’s life. Bagans has been working with Manson’s grandson, Jason Freeman, who won a legal tussle over possession of Manson’s body and organized the late serial killer’s memorial service. Source: John Katsilometes, The Review-Journal, July 28, 2018. See also The Haunted Museum in Las Vegas and Zak Bagans Pays $50K for Ted Bundy's Glasses. There's something seriously wrong with Bagans. Sending someone to steal Manson's ashes is deplorable. Well, Duh! I've been saying all along that Bagans is as crazy as a freaking bedbug. He may have had permission to film the funeral, but did he have permission to take some of the ashes for the painting? If someone grabbed some of the ashes of one of my family members and turned them into a painting, I'd be filing a lawsuit. I agree with you, Jason, Bagans is as crazy as a bedbug.